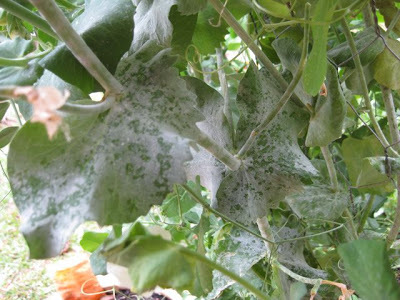 Powdery Mildew: Control with milk! 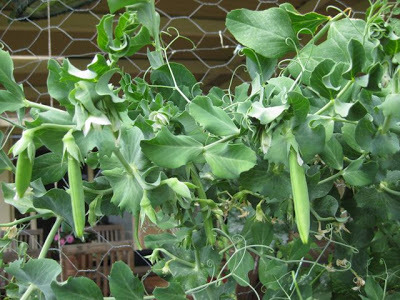 I have had a marvelous crop of peas this year (‘honey-snap’ and ‘snow’). Up until now they have been very healthy, but a couple of weeks ago I began to notice the telltale signs of POWDERY MILDEW beginning to appear on some of the older leaves. Discovering a disease in the garden is often a trigger for a gardener to use a chemical, such as a fungicide to get rid of the powdery mildew. But chemicals often cause other problems. They can affect beneficial micro organisms in the soil, and can kill pollinators, like bees – no bees, no fruit! Our recent period of dry weather, with warm days provide an ideal breeding ground for these fungal diseases. Contrary to what most people think, they actually thrive in dry weather, and not wet. Temperatures between 11-28° C. and excess humidity (without rain) can provide suitable conditions for powdery mildew spores to become active, especially on plants have been affected by drought, or are under-fertilised. Powdery mildew spores are carried by air and, once active, will continue to spread in dry conditions. This fungal problem affects a wide range of fruit, vegetable and ornamental plants. In most plants, it shows as a dusting of grey-white powder on foliage, and distortion or puckering of new leaves. The infection often begins on the underside of leaves. Powdery mildew damage on my pea plants. Now, I hope you were all paying attention in the last article on SOIL NUTRITION because what you are going to read next will make more sense. Powdery mildew is common where plants are deficient in potassium and some trace elements – when the plants have exhausted their supply of fertiliser, or when they cannot absorb nutrients because soil is too dry. In addition, those dedicated students will also know that SEAWEED extract is rich in both potassium and a range of trace elements (including sulphur), and spraying foliage with seaweed tea can be effective against powdery mildew, not because it kills the fungi, but because it quickly provides the nutrients plants require to resist these fungi. 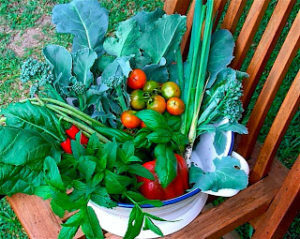 To avoid this problem in future, ensure that fruits and vegetables have adequate complete organic fertiliser to last them through harvesting, including regular applications of COMPOST TEA tea AS A FOLIAR SPRAY, also ensure that they receive adequate water for steady growth but avoid overhead watering. SO HOW CAN WE TREAT IT ONCE IT HAS APPEARED? As an organic gardener, I believe pests and diseases should be kept in their place, so all the remedies used in my garden are safe. They’re safe for pets, for wildlife and for kids. Somebody told me about this a while ago – and it really works! 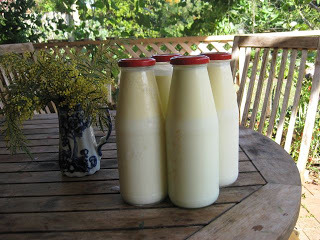 The magic ingredient is one part of the organic milk to 10 parts water – regular milk from the supermarket just doesn’t work. Give it a good stir and it’s ready for use. The objective of spraying is to cover every part of the plant, both sides of the leaves and coat the stems. Fungicides work best as a preventative, not as a cure. It stinks like a dairy once the sun hits it, but doesn’t last for very long. 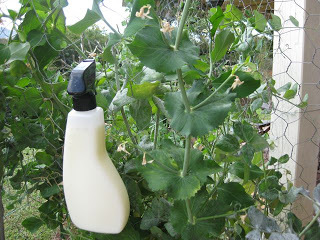 I use this milk spray weekly on my mildew susceptible plants like cucumber, zucchini, peas, beans, tomatoes – and make sure you start as soon as the weather warms up – don’t wait, like I did, for it to appear.